Carpet creases, carpet wrinkles or carpet buckling are all caused by one thing – loose carpet. As a true professional carpet cleaning service we can provide carpet crease removal, carpet cleaning and repair. A qualified carpet cleaner would inspect for a loose carpet before cleaning and offer carpet stretching or carpet re-stretching. 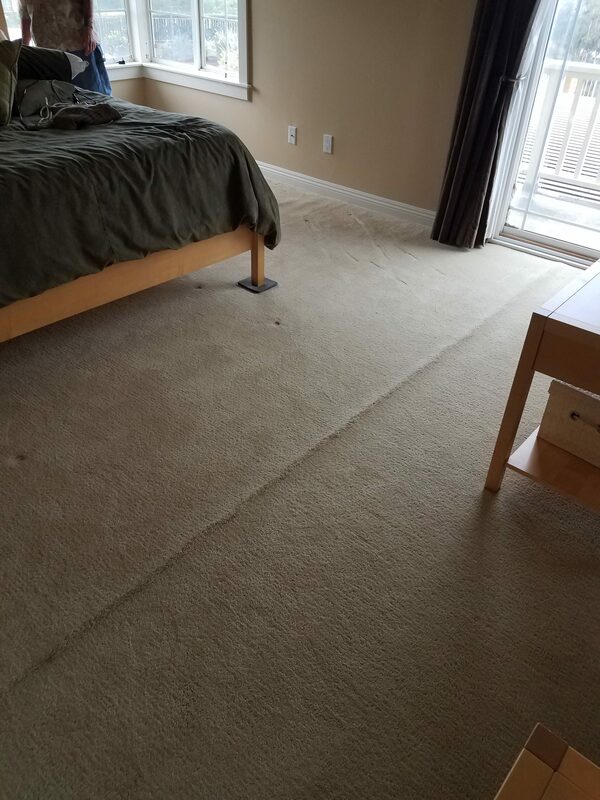 You don’t have to opt for this carpet repair but you should know that a loose carpet gets worse during and after a cleaning. Above is a loose carpet with a long carpet wrinkle. Below is the carpet after we stretched it. The pile of scrap is what was trimmed. You can still see the crease since the hard latex backing has memory. 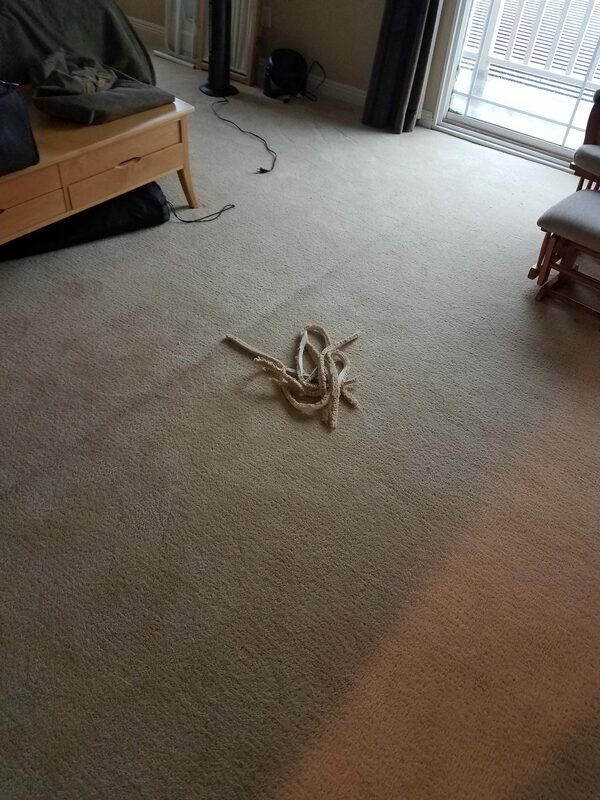 This is why it’s best to hire a company such as Miracle Services to stretch loose carpet and then clean it. 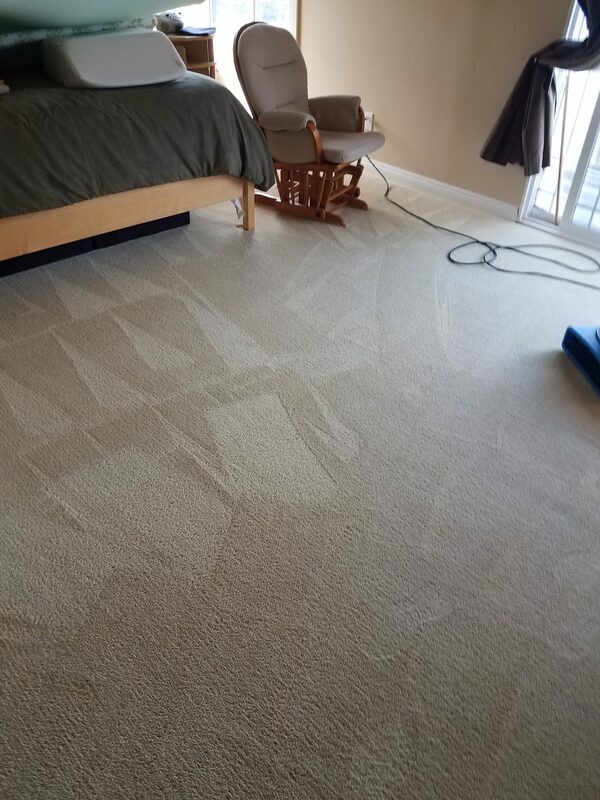 It’s always best to have your carpets cleaned by a professional qualified carpet cleaner. It’s nonsense to get it cleaned and then get it repaired. Every repair needs to be cleaned after. We just explained about removing the crease by cleaning after a carpet stretch but what about a patch? A new patch will stand out like a sore thumb since the patch came from a new existing remenent or a piece from the closet. When cleaned the emphasis is made on blending in the patch to the existing carpet. Also, the carpet strength and seams are tested. Why is my Carpet Loose? Nine times out of ten it was just not installed. It was simply just laid in then bumped on the strips with a knee kicker. Your carpet is “required” to be power stretched but this requires tools, extra labor and time. Installers are normally subcontracted to the lowest bidder and so short cuts are taken. You the consumer don’t know the carpet must be power stretched and your installer knows this. After an install pay someone for an independent install inspection. You only get a 1 year carpet install warranty. Miracle Services can do that for you.